Caring for children comes naturally to many people, and there are those who are lucky enough to know that childcare is the profession for them. But for some, changing career and building a new vocation in childcare might not be a first consideration. A variety of skills are necessary in helping children to grow emotionally, physically and socially – so a variety of people with these skills are needed to fulfil these requirements. After all, childcare is a very important aspect of any child's development and well-being, and should be considered as one of the most valuable jobs for creating our future generations. Childcare is a varied, fun, flexible and ultimately satisfying career path for any person to undertake. The childcare sector is growing fast, and there has never been a better time to enter. The demand for and variety of job opportunities available is remarkably high. So, if you've often wondered whether you could make the switch and change to a career in childcare, you might be surprised at just how easy it could be. There are many different roles associated with the childcare profession, ranging from managerial roles to hands-on assistant jobs. Of course, if you intend to work in the childcare sector, it's safe to say that you think you're good working with children. But it's best to have an idea of a more specific role, so that you can make the most of your skills and strengths, particularly as working with children requires a lot of dedication, patience and enthusiasm. Some of the most common positions found in childcare include working within nurseries and schools, within pre-schools and playgroups, private childminding and playwork. Playwork includes working with children in a capacity that encourages learning and social skills in a fun environment. Out of school clubs and community centres are some of the most common forms of playwork, and can encompass activities such as art and craft, sport, music and drama. If you possess any of these skills, you may find that you're more than suitable in pursuing a career in playwork. If you intend to work on the more business and administration aspect of childcare, you'll need to be organised, and ideally possess a reasonable amount of experience in business, supervision or management beforehand. Interpersonal skills will be of paramount importance, too. These sorts of Skills Are Transferable from many other professions, but, of course, it helps to have a proven track record that demonstrates you understand the needs of a developing child. This is where some training or qualifications in child development might come in handy, or similarly some experience in working with children which might put you that bit further ahead with your employability. When working in childcare, there are certain positions will need appropriate qualifications to fulfil the requirements of the role. These sorts of positions usually include early years education and care, as well as nursery nurses or team leaders. Working with babies and children with a mental or physical disability may also require specific training, such as psychology or child development (sometimes included as a module within a college course). Also, any first aid training will also be a big bonus when working with children. Studying for a childcare qualification doesn't have to be a full-time undertaking. Although full-time college courses are widespread, there are also many opportunities for would-be mature students to study part-time. Diplomas in particular can be studied from home – distance learning is an increasingly popular study option for many. A diploma will also open up opportunities to train on the job, and receive training for further qualifications, such as NVQ Level 3 or a BTEC. If you currently don't have the right entry requirements, such as the appropriate GCSEs to get yourself onto a college course, you can always try an Access to Higher Education qualification. This is basically like a foundation course that will equip you to take your training onto the next step. There are a few routes to gaining the right qualifications for a career in childcare. Obviously, to a certain degree this can be dependent on the specific position you'd like to undertake. But, in most cases, there is usually a college course for each position. You may also be able to Train On The Job, gaining your qualifications as you learn and take on more responsibility, with regular reviews. For some positions, there is the opportunity to combine the two by undertaking a college course while training on the job. It's hard to define a salary in childcare, as it can depend upon a variety of factors, such as the hours worked and location. Pay scales are determined by location, and tend to be set on a local, rather than national basis. The general rule, though, is that the more hours worked, and the more qualifications that you have, the higher salary you can expect to receive. To get an idea of your local salary, you can always approach your local jobcentre. For advice and guidance on retraining to Becoming A Teacher Or Teaching Assistant, read our article in the Caring & Education Category of this site. Yes many NVQ course are practical- based so you need to spend time in a childcare setting. Have a look around, many nurseries offer the change to undertake the NVQ whilst working for them. I want to work with families who are struggling to cope with children under 5 (whether it's emotionally, isolation, PND, etc), known in my local area as Homestart but the company has been very awkward in advising what sort of qualification I would need to progress in this line of work! I would be a mature student with 5 o levels, no highers. I don't know where to start!! If you the organisation will not give information it may be better to look at qualifications/experience in that general area - rather than trying to focus your aspirations on one particular company. Take a look at CACHE which offers a range of Health, Social Care qualifications in Children's/Young People's Settings and also for adult support or try City and Guilds which offers qualifications for woking with children and also specialist course for those supporting parents with young children. There are many voluntary opportunities with organisations like HomeStart so that kind of experience of course would also help you. 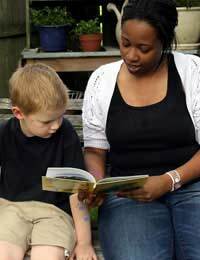 I want to work with families who are struggling to cope with children under 5 (whether it's emotionally, isolation, PND, etc), known in my local area as Homestart but the company has been very awkward in advising what sort of qualification I would need to progress in this line of work!I would be a mature student with 5 o levels, no highers.I don't know where to start!! The majority of the job opportunities involving childcare involve previous experience. Can anyone suggest a way of gaining experience when I have a full time job on the side? I thought about using my day off to volunteer/work experience in a nursery but even then they ask for previous references with children. It just seems like a catch 22!! I found this article very informative. It gave me a clearer view of what I need to gain when going into this sector of childcare, which I am looking to pursue as my career change.